For the EP by The Detroit Cobras, see Seven Easy Pieces (EP). 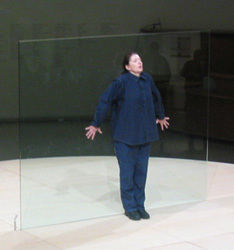 Seven Easy Pieces was a series of performances given by artist Marina Abramović in New York City at the Guggenheim Museum in November 2005. Although the performance art world traditionally frowns on repeating individual works, valuing their transient, ephemeral nature as intrinsic to their essence, as she aged, Abramović found herself compelled to preserve the performances that influenced her own development as an artist. Angry at seeing so many of the ideas developed in her and others' performances being appropriated without credit, including by commercial enterprises such as advertising and fashion, Abramović committed herself to archiving seven iconic works by recreating or reinterpreting them in Seven Easy Pieces, but only with the expressed consent of each of the original artists or their estates. "There's nobody to keep the history straight," she told the New York Times in an interview published in early November 2005. "I felt almost, like, obliged. I felt like I have this function to do it." Seven Easy Pieces is available on DVD . This page was last edited on 11 January 2019, at 18:03 (UTC).